Having a backpack with speakers can be one of the most convenient ways to listen to music on the move. There are of course different things to consider. Battery life, weight, storage options, you name it. One main advantage to a backpack with speakers is that it’s an excellent alternative to earbuds when walking or biking. When biking, especially on the road, hearing cars coming behind you is very important. Earbuds will prevent you from hearing these cars, and it makes you unable to be aware of your surroundings. 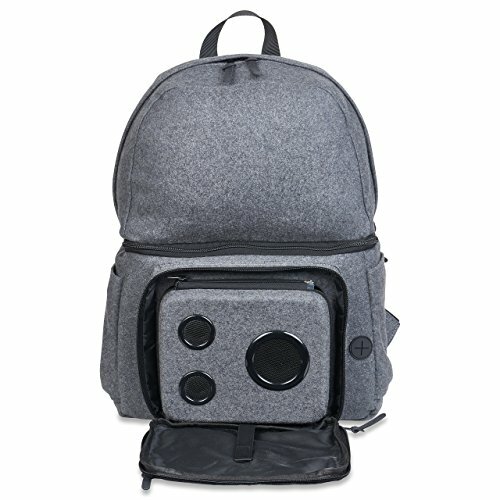 Having a backpack with speakers lets you stay aware of your surroundings while on the move, as well as having an on-the-go sound system for meeting up with friends. Whether meeting up to toss a frisbee at the park or your next picnic date, a speaker backpack can bring even more fun into any outing. The backpacks below are the top picks on the market. Whether it’s longer battery, weight, or style, there’s a speaker backpack out there ready to keep you, and your friends entertained. 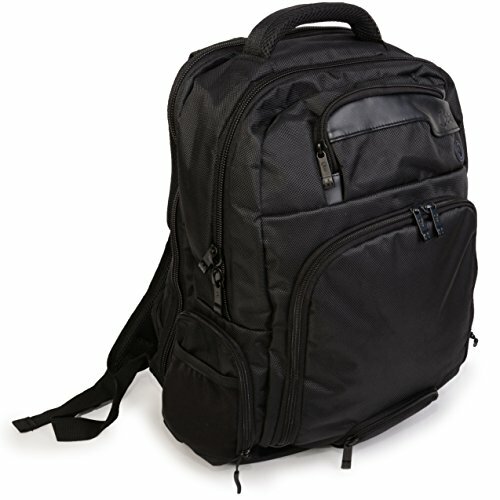 Are These Backpacks Good for Camping? Which Backpack is the Best for Longer Trips? What’s the Best Backpack for Travelling? Are There Any Rules and Laws About Playing a Stereo Out Loud? What if the Battery in the Backpack Dies? 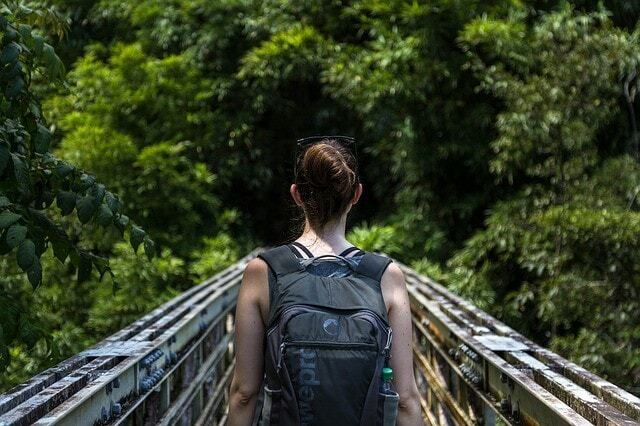 Que offers outdoor activity enthusiasts the Jambag Backpack with a promise “[This is] a product built for the active lifestyle.” Considering this product’s design, features, and ergonomics, Que has done a phenomenal job delivering on that promise. State of Art Portable Battery Power Station: You can rely on the built-in 4000 mAh battery power station to save your devices from dying out on you during crucial moments. The power station has dual USB ports. So, you can charge two devices simultaneously. To charge the power bank, you can use the USB to USB cable that comes along with the product. To recharge the battery you plug it into an USB source – for example computer or an outlet if you have a wall charger. Power Monitor: You can monitor the charge remaining in the power station using five LED lights. It’s a simple and intuitive way to represent battery level. Dual Bluetooth Speakers: Jambag’s 10-Watt amplified stereo speakers deliver quite a punch. The speakers’ loudness and clarity will surprise you. You can connect your device to the speakers via Bluetooth 4.1 and listen to your favorite songs for up to eight hours. Bluetooth 4.1: The previous version of Bluetooth, version 4.0, interfered with 4G (LTE) frequency. Version 4.1 eliminates this interference. Besides this, the new version gives higher data transfer speed and uses power more efficiently. Thus giving better connectivity and quality of sound. Handy Multimedia Controller: A pouch at the bottom of the bag’s front portion contains a multimedia controller. Using the controller, you can change tracks, control volume, accept/disconnect calls, pause/play music, and issue commands to your phone via SIRI or Google Assistant. It’s a neat feature that makes it easy to interact with the speakers and saves you a lot of time. Made from Highly Durable Fabric: Que has rigorously weather tested the fabric used to make the Jambag. The fabric is resistant to water, high temperatures, and low temperatures. So, everything in your bag will remain safe until you can find shelter from almost all the unexpected weather events. Thoughtful Pocket Placement: Well-placed external pockets give you easy access to your phone, cards, or wallet. The front flap has an active tablet window that enables you to use your tablet while it lays safely inside the bag. For additional security, you can store your valuables in a pouch at the rear of the bag. TSA Compliant: The Jambag provides a way to show an unobstructed image of your laptop when going through X-ray screening. So, you can pass your bags through screening without taking your laptop out. One Year Warranty: The Jambag comes with a one-year warranty. For details regarding the warranty, you can get in touch with the manufacturer. Hidden Water Bottle Pouch: The mesh bag on the left side of the bag is the perfect place to store your water bottle. When you’re not using it, the pouch blends into the fabric. Available in Three Colors: Que offers the Jambag in three color schemes: black, gray, and camouflage. Dimensions: The dimensions of the bag are 18 x 16 x 8 inches and dimensions for the laptop compartment inside the bag are 14 x 11.5 x 1.5 inches. A downside to the product is the lack of padding in the adjustable shoulder straps. Overall, most customers are really happy with the product and it is rated 4.4/5.0 on Amazon, which is rare! The first thing that hits you when you see this product is the bold self-proclamation “THE #1 Speaker Backpack in the World.” Although one must commend the manufacturer’s confidence, they don’t decide how good the product is – you do. Storage Compartments: The backpack’s main storage compartment is spacious enough to accommodate two laptops and still have room to spare. The main compartment also has a separate sleeve to secure your laptop. The secondary storage compartment is large enough to store a textbook. The third storage space has the Bluetooth speakers. You can remove the speakers to make more room for your stuff. Full-Range Removable Speakers: The Rager Backpack has a 2.1 stereo speaker built into it. That’s two full-range speakers and one eight-Watt sub-woofer. You can connect your device to the speakers using the aux cable that comes with the product or via Bluetooth. And if you feel you won’t need the speakers, you can remove them. Long Battery Life: The 2018 version of the Rager Backpack has a USB-powered lithium battery that lasts for up to four hours. Dimensions and Weight: The dimensions of the bag are 17 x 13 x 6 inches and it weighs around 2.3 pounds, with the speakers. Build Quality: The Rager Backpack has a premium feel to it. The design is neat, modern, and streamlined. The materials are sturdy, durable, and well-suited for an active outdoor lifestyle. The padded back and the padded shoulder straps enable you to heavy loads with minimal strain. Although this bag doesn’t have enough space for an overnight trip, it is perfect for any day-long outdoor activity. It is stylish, durable, functional, and convenient. And it is available at a reasonable price. So, the product has legitimately won the bragging rights to the #1 speaker backpack in the world. The Ultimate Rager Cooler Backpack is one of the more multi-use backpacks on this list. As you you’ve read, the others are just backpacks. This backpack is also a cooler! The Ultimate Rager cooler is the perfect candidate for beach trips, day trips to the park, or even going to the next ball game! Removable speakers. Held in the front pouch with a removable zipper is where you’ll find the speakers. This stereo includes high-quality 2.1 speakers with an 8-watt subwoofer. This provides the ultimate sound quality with a removable design. 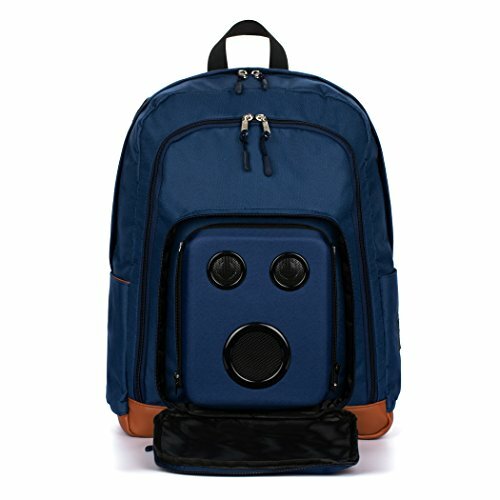 This design is perfect if you want to take the speakers somewhere that you don’t want to carry the whole backpack. Shock resistant design. We all know that sometimes accidents happen. If you drop your bag, you’re covered! Although it’s not a guaranteed drop, you’re at a much lesser risk of damaging the bag or speakers with this design. Wide compatibility options. The Ultimate Rager is compatible with iPhone, Android, iPad, and other tablets via Bluetooth. The stereo also features a 3.5mm jack, just in you choose not to use the Bluetooth feature. Built-in rechargeable power bank. We all know that music apps can kill your battery very quickly. With the Ultimate Rager, you don’t have to worry about that! It has a built-in power bank that allows you to charge your USB device, whether a phone or tablet! Lightweight. The Ultimate Rager only weighs 3.05lbs shipped! This is much lighter than most coolers, and those don’t even have speakers. The weight of this cooler makes it an excellent option for parks, camping, or even beach days. Water resistant. Many reviewers have mentioned that they purchase this cooler for beach and boat trips. This backpack is the perfect candidate as it is water resistant, so you know you can get through the trip without damage. Although water resistant, it’s not submersible, so make sure not to get it too wet! Half backpack, half cooler. All of these activities that this backpack is good for will often require more gear than just drinks and music. The top half of the backpack is a normal pack, allowing you to store items that aren’t needed in the cooler, while you can keep your food or drinks ice cold in the bottom! The cooler portion of the pack is the ideal size for a six-pack! All in all, you can’t go wrong with the Ultimate Rager Cooler Backpack. You’ll have cold drinks, music, and even a charged phone. The Powerback from Que caters to people looking for a speaker bag that is budget friendly and not feature-heavy. Portable Battery Power Station: The Powerbag carries a portable 2200 mAh back-up power bank. The power bank comes with a built-in Apple 30-pin Sync Cable, Universal Micro USB cable, and a USB charging port. Bluetooth Speaker: The Powerbag houses two Bluetooth speakers in pockets on the sides of the bag. You can easily pair the 10-Watt stereo speakers with your device. Unlike the Jambag, which uses Bluetooth 4.1, the Powerbag uses Bluetooth 3. But, this downgrade won’t make a big difference to your listening experience. Durable Make: Que has extensively tested the Powerbag’s fabric to guarantee durability. The fabric is resistant to water, high temperatures, and low temperatures. So, you’ll never have to panic about the safety of your devices in case the elements throw you a curve ball. Padded Shoulder Straps: This was one of the biggest drawbacks of the Jambag. The Powerbag doesn’t have this problem. The Powerbag’s shoulder straps are wide and well-padded. This makes carrying heavier loads easier and more comfortable. Plenty of Pockets and Compartments: The placement and design of the pockets on Powerbag makes it easy for you to organize all your stuff. There are four side pockets; two on each side. The bottom side pockets hold the speakers, so it doesn’t leave much room for anything else. There’s also a top compartment under the handle. Besides the main storage compartment in the front, there is a secondary storage compartment at the back. No Water Bottle Pouch: Every outdoors enthusiast knows how important it is to remain hydrated. So, your backpack must have an accessible place for storing a water bottle. The lack of such a provision is a major inconvenience. Too Many Pockets: While some people like to get by with just a few pockets, some people can’t have enough of them. If you are one of the former, the number of pockets of on the Powerbag will give you a mind-freeze. No Multimedia Controller: Since the Powerbag doesn’t have a multimedia controller, you must change tracks, control volume, and pause/play songs using your device. No Warranty Information: The Jambag comes with a one-year warranty. However, Amazon displays no information regarding Powerbag’s warranty other than 30-day-no-questions-asked usual Amazon return policy. No Laptop Sleeve: The Powerbag doesn’t have a separate laptop sleeve. So, the bag doesn’t provide a way to secure your laptop inside it. Heavy: The Jambag is about 2 pounds, but the Powerbag is 5.2 pounds. Delicate Wires: the wires and cables running in the bag, such as the ones going to the speakers, are thin. You might accidentally damage the wires if you’re not careful. In summary, the Jambag is a tech-lover’s dream, the Powerbag is a regular backpack with speakers and a power bank. So, if you’re looking for a backpack with some helpful add-ons, go for the Powerbag. But, if you want a technology platform to store, charge, and use your devices, buy the Jambag. So, Que isn’t charging you more for the Jambag for nothing. In fact, waiting a little to save money to buy the Jambag is worth the time. 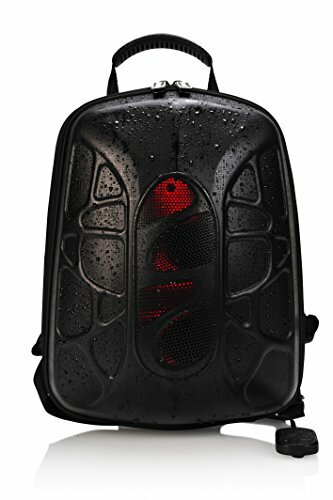 The TRAKK SHELL Waterproof Multi-Function Bluetooth Speaker Backpack is not a travel backpack. But, it is perfect for people who run, jog, walk, cycle, or exercise outdoors every day. It has a hard shell-like front and a solid back, which is why TRAKK guarantees that the product is waterproof, shockproof, dustproof, and stain resistant. At the same time, it’s small and lightweight. Although you wouldn’t buy this for the storage, this backpack has enough space to accommodate everything you will need for a short outdoor adventure. Built-in Speakers with Max-Bass Technology: The backpack has two five-watt speakers. The Max-Bass technology powering the speakers produces high-quality sound even when you’re really rocking the volume. You can pair your smart phone, mp3 player, tablet, or computer to the speakers via Bluetooth 2. You will get an aux cable with the backpack, but you have to buy any other audio cable separately. Power Bank: The power bank in the TRAKK SHELL backpack has a capacity of 5200 mAh. To put this in perspective, the iPhone 7 runs on a 1960 mAh battery. So, you can fully charge the phone nearly three times. And if you’re using the backpack to listen to music only, the power bank will last around 12 hours. You can recharge the power bank with the cable included in the package. Wired Remote: When you’re on the go, you can use the wired remote to switch tracks, change the volume, play/pause tracks, answer/end calls, and turn the LED lights on or off. When you’re not using the remote, you can secure it by clipping it to the shoulder straps. Since the remote has a mic, you can make calls using the remote. But, make sure you hold the remote close to your mouth. Multi-Color LED Lights: The mesh-like panel on the front of the backpack is an LED light that cycles from warm to cool colors. Anyone engaging in outdoor activities at night can turn the lights on to warn vehicles. Plenty of Pouches and Pockets: This backpack has no external pouches or pockets. The storage space inside, however, has numerous places where you can safely store all your gadgets. Dimensions and Weight: The dimensions of the backpack are 11.8 x 6.3 x 15.7 inches and it weighs about 3.6 pounds. One Year Warranty: The product carries a one year warranty. This backpack is great for anyone who wants to carry their tech along with them when they are outdoors. But, to carry anything more, you’d need another backpack. Depending on the way you look at it, this is perhaps the product’s biggest positive or negative. Here’s a recap of what you’ve read. 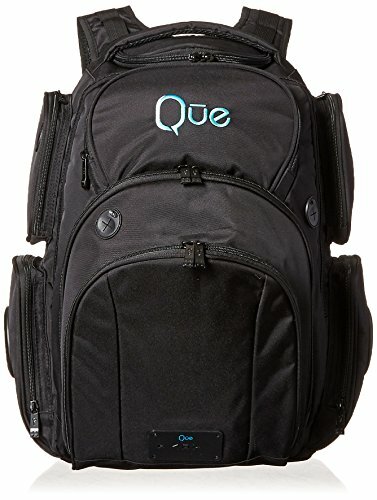 Que offers two speaker integrated backpacks: the Jambag and the Powerbag. The Jambag is superior to the Powerbag in every respect except the cost. It is also worth noting that Jambag is TSA compliant which saves you trouble on the airport. The TRAKK SHELL backpack is a straightforward choice if storage isn’t a concern. It also has a very unique style that can attract a lot of attention, which can be both good or bad. Finally, the Rager Backpack provides the best price to utility ratio and with the recent upgrades it is an excellent choice as well. That depends on how long the trip is, and how far you plan to hike. If it’s a simple overnight trip that’s not too far, the Ultimate Rager Cooler or the Jambag would be the best option as they’re both water resistant. The Trakk Shell is the best bet for longer trips as the battery will last around 12 hours if only listening to music. The Trakk Shell will also charge your phone up to three times if you’re not listening to music. If you need more space as opposed to battery life, the Jambag is the best option. The Jambag is the best option for travelling as it is TSA compliant. This means that there will be no issues when going through security at an airport. This really depends on the area, make sure that you follow local rules and laws about noise. Typically, during the day as long as you’re not being disrespectful, there won’t be an issue. These backpacks are excellent options for cyclists that are avoiding using earbuds. portable power supplies as well. Hopefully, by now you are able to find a backpack with speakers that meets your criteria. If that’s not the case, feel free to leave a comment. I will do my best to help you find the product you want. A nice, thorough review, but this this is a terrible concept! When I go bushwalking a big part of the experience is connecting with the environment that I’m in, and sharing the track with some jerk blaring out their idea of the perfect bushwalking theme music would be horrible! Hopefully this doesn’t take off anywhere I go bushwalking. Thank you. this reveiw helps me greatly!!!! Do any of these bags have aux 1/8 inch in. REALLY IMPORTANT!!! Thank you!! Hi Mac, the The 2018 Rager Backpack has an AUX cable that is included with the backpack.